It’s cruel. It’s painful. It knows every weakness you have and it digs right into them. It’s unfair, and at times feels malicious. It’s probably even worse for those who peak early. While the rest of us learn gradually, day after day, just how difficult the world can be, some people must face it all at once…the rudest of all possible awakenings…after being led to believe that they were different. That they’d be loved and celebrated forever. Or, at the very least, that they’d be okay. Child celebrities are our most enduring examples of this. They learn that the world is one thing, but, gradually, the money disappears. They lose their youthful cuteness. The more mature, more complex roles don’t come. They were born into one world, and, all at once, they wake up in another. One in which they aren’t adored, but laughed at. Mocked. Framed as cautionary tales. Some of them adjust. Many of them don’t. Every child is willing to believe he is extraordinary. Celebrities, however, actually have hundreds or thousands or millions of people sustaining that illusion for them. Making it feel real. Making it feel permanent. Then the bottom falls out. And some of them just keep falling. The Boy Detective Fails is about an extraordinary youth who isn’t a youth anymore. Billy Argo was a naturally gifted child who never learned how to be an adult. And he grows up, as we all must, to find that he’s unprepared for the world of employment, of romance, of…well…responsibility. It’s a very funny book, and it’s also deeply, bracingly sad. As children, Billy, his sister Caroline, and their best friend Fenton solved crimes. They banded together, the little scamps, to piece together the clues that the police missed. They used their intuition, their particular skills, their friendship to make the world a safer, cleaner, better place…one moustache-twirling criminal at a time. Billy doesn’t know what to do. And that’s The Boy Detective Fails. It’s the story of a man too smart for his own good that doesn’t know what to do. It’s the story of a genius learning, for the first time, the things you and I forgot long ago. It’s the story of someone who spent his entire childhood being told who he was, and now has to discover the real answer for himself. There’s a deep, affecting, heart-breaking sweetness to that, and the book handles it brilliantly, striking an absolutely razor-perfect balance between the comedy and the pathos. It’s tricky, and the story threatens to pull author Joe Meno too far in either direction. He never lets it. Our familiarity with fallen child stars–or at least those who peaked early, and were unprepared for what the world actually was–has led to a number of riffs on the idea, pairing this concept with certain exceptional, fictional character types. The two fit together very naturally. The Venture Bros., for instance, uses boy adventurers. Watchmen used superheroes. The Boy Detective Fails uses, of course, young detectives…most specifically Encyclopedia Brown, whose shadow deliberately resembles the one cast by poor, lost Billy Argo. We use fictional characters to better understand our actual lives. By putting ourselves in the heads of characters, get to see the world from another perspective. Which is what makes things like Watchmen, The Venture Bros., and this book so interesting: we step outside of our heads once, and then we take a step further. We identify with one aspect of these exceptional characters, and then are forced to come to terms with another. 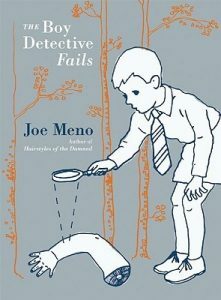 The Boy Detective Fails is deceptively complex. It’s not a difficult read at all, but Billy’s adjustment from celebrated child to tormented adult is a fascinating one, and Joe Meno leaves enough of his threads unconnected–artfully so–that only rarely will two readers come away with the same understanding of Billy’s situation. It has its clear ups and downs, but it also has its important ambiguities. Billy does find love. Kind of. Billy does find friendship. Kind of. Billy does make peace with his old, scheming nemesis. There are no easy answers, and, debateably, there’s not even a definitive ending. I’ve read it several times and I’m still not sure if one specific final gesture of Billy’s is reassuring, or darkly comic. I understand his intention, don’t get me wrong…but I’m not convinced I fully understand Meno’s. The Boy Detective Fails is a mystery in itself. Not the mystery it claims to be, exactly. No…it’s more a puzzle of existence. It’s more a questioning of why any of us are here…and what responsibility we have to our own reputations, to the people around us…to those we affect without even realizing it. It takes a lot for me to refer to something as “a great novel.” There are many good ones. Many important ones. Many worth reading. Many I’d recommend. But I don’t know how many great ones I can really identify, without any kind of qualification or second thought. And yet, as simple as it is, as silly as it is, as well-trod its subject matter, I do think The Boy Detective Fails is a great novel. It cuts in a wholly unique way to the truth of what it means to be alive, here, on this planet. It relishes the ridiculousness of the human condition, and while it doesn’t–and shouldn’t–offer much advice for how to transcend this, it does offer a bit of companionship along the way. Which is probably the most important thing any of us can offer to anyone else. We’re all here. We’re all being dragged, slowly, toward the end. Life hurts. It’s cruel. It’s painful. But, you know what? You don’t have to go through it alone. And as difficult as the journey might be, as inevitable the sadness of its end, as painful as it is to know that the people you love are suffering, too…well…you might still find some small moment of redemption along the way. Whether or not that justifies anything is up to you.